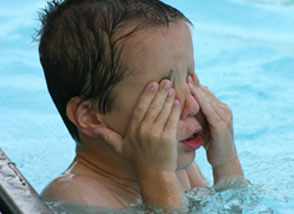 Eyes and skin can become irritated after spending time in the pool for various reasons. Out of balance pool parameter, specifically pH, can cause eye and skin irritation in swimmers. A build up of contaminants in pool water can also create chloramines (a chlorine smell) and contribute to eye/skin irritation.